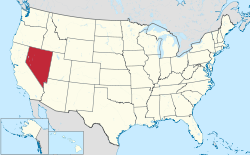 Nevada is a state located in the Western United States. According to the 2010 United States Census, it is the 36th most populous state, with 2,700,691 inhabitants, but the 7th largest by land area spanning 109,781.18 square miles (284,332.0 km2). Nevada is divided into 17 counties and contains 19 incorporated municipalities. 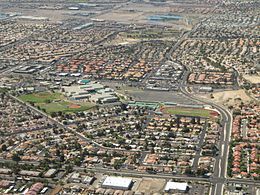 Nevada's incorporated municipalities cover only 1% of the state's land mass but are home to 56.7% of its population. Incorporated places in the state are legally described as cities, except for the state capital Carson City, which has no legal description but is considered an independent city as it is not located in any county. To incorporate, a petition for incorporation can be made to the board of county commissioners, who consider numerous geographic, demographic, and economic factors. Cities are categorized by population for the purpose of determining the number of wards and council election structure as well as the number of city clerks: cities with 50,000 or more inhabitants are in population category one, cities with 5,000 or more but fewer than 50,000 inhabitants are in population category two, and cities having fewer than 5,000 inhabitants are in population category three. Cities are responsible for providing local services such as fire and police protection, road maintenance, water distribution, and sewer maintenance. 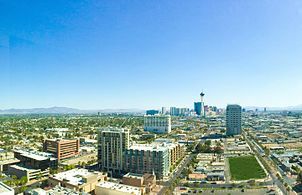 The largest municipality by population in Nevada is Las Vegas with 583,756 residents, and the smallest is Caliente with 1,130 residents. 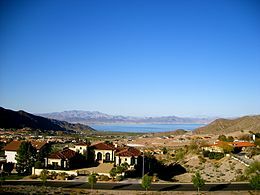 The largest municipality by land area is Boulder City, which spans 208.52 sq mi (540.1 km2), while Lovelock is the smallest at 0.85 sq mi (2.2 km2). 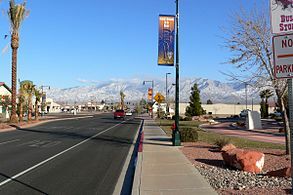 The first place in Nevada to incorporate was Carson City, on March 1, 1875, and the most recent place was Fernley, on July 1, 2001. 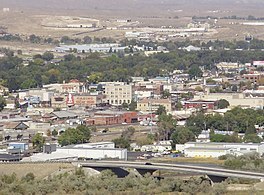 ^ Fernley incorporated on July 1, 2001 and thus does not appear on the 2000 census. ^ a b c d e f g h i "GCT-PH1 – Population, Housing Units, Area, and Density: 2010 – State — Place and (in selected states) County Subdivision". 2010 United States Census. United States Census Bureau. Retrieved September 16, 2016. ^ a b "Nevada: 2010 Population and Housing Unit Counts 2010 Census of Population and Housing" (PDF). 2010 United States Census. United States Census Bureau. September 2012. p. III-2. Retrieved August 8, 2016. ^ a b c "General Law for Incorporation of Cities and Towns". No. Chapter 266 of 2016. Retrieved June 24, 2017. ^ a b Hill, John J. (1875). Statutes of the State of Nevada. 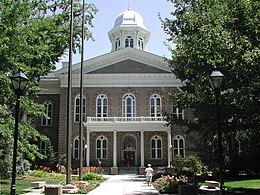 Carson City: Seventh Session of the Legislature. p. 87. ^ a b "Nevada League of Cities and Municipalities Municipal Directory" (PDF). League of Cities and Municipalities. February 2017. p. 12. Retrieved June 24, 2017. ^ "2000–2010 Entity Changes" (txt). 2010 United States Census. United States Census Bureau. Retrieved June 17, 2016.